Dear Daniel, I must read this book. Do u want profit from the history of your father? 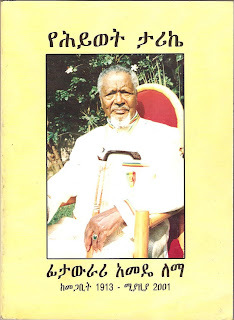 If u loves your father and to propagate your father's name through The Ethiopian's mind,why don't u sell by 10 birr only? you should cover the cost of the book. Thank you Daniel: This was a man who did a lot for Ethiopia. The goverment and the media should had done better on his death how they broadcasted. Fit. Amedie Lema,IS a national, hero and a,true icon of ethiopian nationalism and statesmanship ,he was a relentless advocate,to the interest of a greater ethiopia and its people,he was a seasoned,poletician and blessed with wisdom which enabled him to speake his mind through three generations of ethiopian government with out retribution and fear of reprisal ,which is a manifestation to his true nationalism and deep knowledge of the ethiopian affairs.it is a great read for any body who wants to know the historical journey of Ethiopia past present,and may be a glimse of future if the status qou contineus.the title of the book is rather misleading as much of it is about his views on national issues.we all owe gratitude to this great national hero.GOD BLESS HIS SOUL! I wish one of his children, specially the one who lives in Atlanta lives his life half of his father's legacy. He is a waste and an embaressment to his family. I don't want to name his name, he is well known with his out of hand ways of talking to people he encounter with. I agree Fitawrare Amade is a well deserved hero of our country. May god bless his soul.